Scooter fans remember that the Vespa was borne of necessity and utility and was once the toast of of the motoring world for its efficiency and design, both visually and mechanically. History always suggested to me that if scooters were truly to catch on in America (as opposed to occasional fads), it would be an equally efficient and simple model from a innovative startup, but with modern conveniences and a lot of advertising money. It’d probably be electric, but it’d be street legal and convenient, and would win us all over somehow. The response to the BMW scooters makes me wonder how wrong I am. I’ve never seen a scooter get so much coverage in American mainstream media. Maybe PiaggioUSA was right, maybe scooters will never succeed in America without being considered a luxury, and Piaggio/VespaUSA’s only failure was lack of name recognition and advertising/PR smarts. There are few people in America that don’t recognize the BMW name, and even in a dreadful economy, there are plenty of Americans who gleefully snap up wonderful-but-overkill BMWs, Audis, Leicas, and Tiffany jewelry. Nowhere in the world does a brand name matter more than in America. Only in America would people buy $8,000 scooters to save gas money. It was logical that they’d pay even more for a scooter bearing a blue and white rondel. I’ve said before: while media and scooter dealers love to use the economy and gas prices to hype scooters, but American scooter buyers use those factors as justification to buy themselves expensive toys. Scooters are recreation here, not transportation, and boy do Americans love to spend money to forget about their money problems. So that’s why I’m not very excited about BMW’s 2012 scooters. I’ve got no problem with their modernity. They’re probably very well-made (Though it seems likely the engines are coming from Kymco, who’d be happy to sell you a good scooter for much less). They’re also handsome, and more than up to the job of schlepping you around town. They’ll almost certainly do well in Europe, where it actually makes economic and practical sense to buy a luxurious scooter rather than a small car. But there’s very little ‘scooter’ in these BMWs, or at least little of what originally attracted me to scooters. 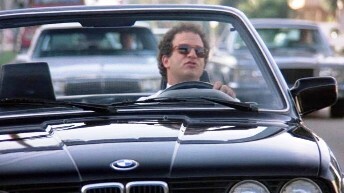 BTW, I was looking for a photo of Albert Brooks in “Lost in America” in his crossing guard outfit with the Mercedes, but couldn’t find it, as it happens, he apparently drives a BMW in “Defending Your Life” which I’ve never seen, hopefully the sentiment of that film still makes sense in this context. I just hope that maybe BMW will be able to transition from using the word scooter to something else. Something with ‘rad’ at the end. And then maybe the word scooter can have meaning again. The term moped better describes the idea of the spirit of a scooter better. But the fact that that word is so clearly describing something else, it shouldn’t be used on principle. It’s not even a name thing for me, to each his own, I’m just saying, it’s not something I’m interested in, which is usually a sign that it’ll become wildly popular. Hard to see a $11K-$12K maxi scooter becoming wildly popular, but I think BMW USA has a good idea of how many they’ll sell and who’s going to buy them. I saw the scooters at IMS, sat on them, took them off the stands. I’m on a “list” to test ride one, though the arrival date has been pushed back and they may not be available in the US until next fall. Without riding it, I can say that on the outside, it’s everything you would expect from a BMW maxi scooter. Sleek, but luxurious. Stock heated seats and grips. Very nice fit and finish. But, in the end, it’s just a really nice maxi scooter. The only thing transcendent about it is the BMW roundel. Debadged and stripped of bells and whistles, it would be just a very nice T-Max or something like that. These are built for a type of riding that I’m not interested in. Even when I think about touring, I think about doing it on smaller scooters and taking my own damn time. These may bring a lot of new customers to scooters, but many will balk at the price. Some of those may go for a lower-priced option. Others will shrug and buy a motorcycle or nothing at all. I think you may be reading too much into the new BMW Scooter concept. 1. Great machine for older riders who can no longer reach the ground from those high-seat BMW motorcycles. 2. Great machine for the die-hard scooter rider who wants a bigger machine, but has no desire to ride a motorcycle. 3. Great machine for anyone wanting a truely different kind of machine. 4. I also love the fact they are offering a touring version. I thins this is for those die-hard BMW touring folks that stress over wheather or not they can tour with their current machine. I don’t see it as something different at all. Something different for BMW, but pretty typical for the large displacement, automatic, possibly step-through, power two-wheelers offered by Yamaha, Honda, Suzuki and Kymco. It just says BMW and decked out to the standard that matches the badge. If someone was waiting for this and couldn’t find it, they were only really looking for the badge, or wanting to pay 2X the price for the worlds best integrated farkles.